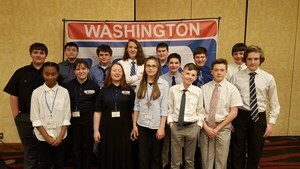 This year Centennial Middle School brought 15 students to the Washington State TSA competition in Seattle. Our group was part of 1200 students statewide who competed in 65 different technology-based events at the middle and high school level. Our students worked hard all year preparing for their events at our weekly meetings after school. Some of the competition events our students participated in included, Prepared Speech, Problem Solving, VEX Robotics, Flight, Children’s Stories, Digital Photography, and Dragsters. Over the 3 day conference students were not only able to participate in competition but to also learn about different colleges and their programs offered in Washington state, participate in outbreak sessions focusing on different leadership skills, and have some fun dancing, playing games and winning prizes at the carnival event in the evening. Overall, our Centennial students were able to make new friends, show-off their technology and leadership skills, and have some fun at the Washington State TSA Competition.